By studying survival routes required during mouse developing livers, we have shown that the RTK Met activates two novel signalling pathways involving well known proto-oncogenes to promote cell survival in vivo. In particular, we found that Met prevents Fas-triggered degradation of the anti-apoptotic signal Flip acting on the PI3K-Akt pathway. Moreover, we demonstrated that Met acts on PI3K to promote translation and nuclear translocation of Mdm2, which is known to antagonise p53 activity and cell death. 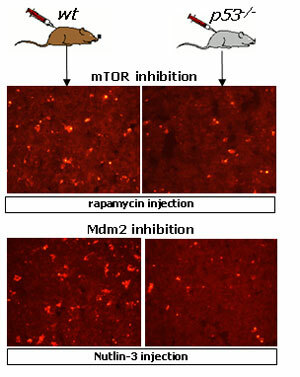 The PI3K effectors are selectively used to control Mdm2 activity: a) Akt promotes Mdm2 nuclear translocation; b) Akt-mTOR pathway is required for Mdm2 translation. These studies have enlightened novel RTK-triggered signalling mechanisms for cell survival during embryogenesis. In cancer, the success to form metastasis is dictated by the ability of malignant cells to counteract safeguard systems that normally kill “dislodged” tumour cells to prevent their dissemination. For example, cancer cells are exposed to stresses, such as cell rounding (also known as anoikis), nutrient depletion and hypoxia, which they are able to overcome. The link between metastasis and resistance to apoptosis appears to have significant clinical application. The intrinsic survival capability of cancer cells probably determines the organ-hosting metastasis. Conventional therapeutic drugs function by inducing apoptosis of cancer cells. However, metastatic cells are generally less responsive to chemotherapies when compared to cells of the primary tumours. Thus, it is reasonable to hypothesise that metastatic cells have acquired high resistance to apoptosis in response to chemotherapy, which in turns allow them to escape death and colonise other organs. This possibility indicates that it is important to identify molecular factors involved in survival of metastatic cancer cells in order to develop molecular therapies that target these factors. We are investigating: 1) whether the novel signalling routes that we have identified contribute to increased survival properties of neoplastic cells with aberrant RTK signalling; 2) to which extent un-favouring survival of malignant cells can enhance efficacy of anticancer treatments, circumvent resistance to drugs and permit long term/maintenance therapies. 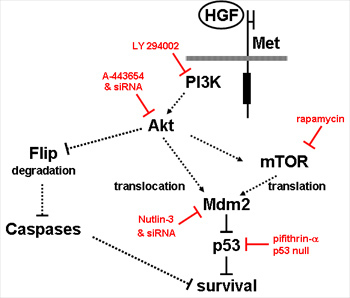 PI3K-Akt-mTOR pathway and Mdm2 are often found aberrant in cancer cells and their inhibitors are considered potential anticancer therapies. By addressing these questions, we aim at exploring the effectiveness of combined molecular therapies to shoot cancer.